The pallets are excellent for improving those areas of your garden or patio that you have underutilized. There are many things you can create with the pallets, these 10 examples are just a few little ideas that you can do with them, but there are many other possibilities that only your imagination can limit. Garden lamps can help us to define what is the driveway to our home, they can be very useful in those gardens that are very large and need some lighting, or for example to acclimate a party. Here we show you how to make the one on the image. The hammocks are usually made with ropes, but this does not preclude that also can be build using pallet planks. How to do it? follow the following link. You want to create something very decorative and useful at the same time? This mailbox made with pallets will be the envy of your neighborhood, check this link to see how to do it. Definitely our favorite idea, a space for getting relaxed, chill-out type made exclusively with stacked wooden pallets. Somewhat more complicated to do, yes, but not impossible. Follow our step by step guide to build one. Nothing succeeds more than making an outdoor sofa for the garden, they are especially easy to do, definitely the most popular star furniture of our blog. I teach you how to build a sofa with a chaise long, a little sofa, and a classic sofa with its respective furniture kit. The planters made with pallets of course are a classic of our gardens, probably are the most decorative and also natural elements that we are going to see, the only drawback is that they require more maintenance too. Here we show how to make a large pyramid planter , and in that other link a simple planter. The swings can be built only with a pallet plank and 2 ropes, you only will have to hang the ropes on a tree branch. But if you want to have a more elaborate and decorative super swing made with pallets it’s also possible. In this link I show how to make a hanging bed, and in this one a hanging sofa with pallets. Another great classic exterior decoration are the vertical gardens, a more sophisticated tipology of elements but accessible to everyone. See how to make one at the following link. Fences are the most useful items, you can found the more simple ones, made with just whole pallets to prevent the animals from escaping or enclose an area, but also you can find more beautiful and elaborated fences. Visit this link if you want to see one like the one on the example image. And to finish with our list of ideas, we recommend you to build an organizer with pallets as the one on the picture, is the best way to neatly arrange our garden tools occupying a minimal space and also being decorative and easy to build . In this link you can see an excellent one. 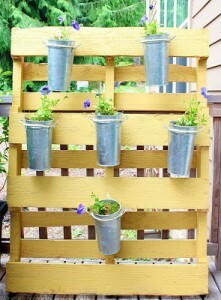 Do you like this pallet furniture ideas for the garden? Do you want to look for more pallet furniture?